The Eglinton Connects Streetscape and Cycle Track Preliminary Design was initiated in late 2017. Preliminary Design of Streetscape – review the existing corridor for streetscaping opportunities, such as improved sidewalks, furnishing zones and planting zones. Preliminary Design of Cycle Track – review the existing right of way, including travel lanes and parking lanes, to develop a preliminary design and feasibility constraints for the installation of cycle tracks along Eglinton Avenue. This work is being coordinated with the Eglinton Crosstown station design and construction currently being delivered by Metrolinx. 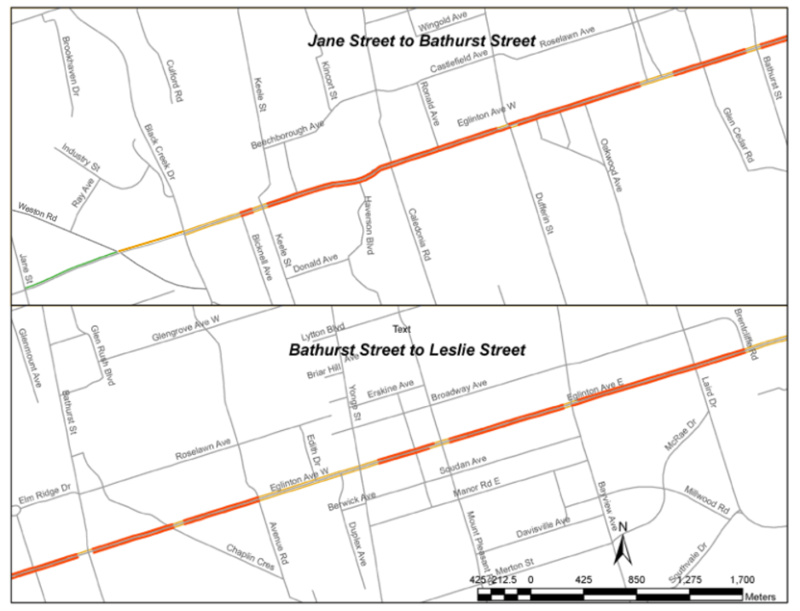 This initiative follows the Eglinton Connects Urban Design Environmental Assessment Study, completed in 2012-13, and the Environmental Assessment Traffic Study, completed in 2014. These studies looked at building heights, densities, streetscaping and traffic lane configurations; as well as concepts for cycle tracks on Eglinton Ave. Toronto City Council approved the recommendations from the EA Study in 2014, and directed City staff to develop an interim design and implementation strategy. The streetscape and cycle track designs are advancing in parallel, with preliminary design to be completed by summer 2019. Public and stakeholder consultation will be an important part of this project. Please view the Consultation tab for more information. Detailed design, tender and contracting are not part of this study. This work will be undertaken in a future phase. Public consultation is an important part of this study. Consultation with local Business Improvement Areas (BIAs) took place in the spring and summer of 2018. Further stakeholder and public consultation will take place in 2019. Information for all events will be posted to the website and emailed to the project mailing list. If you would like to add your email to the project mailing list, please contact Andrew Plunkett, Senior Public Consultation Coordinator, at Andrew.Plunkett@toronto.ca. Under the Public Transit Infrastructure Fund (PTIF) – Phase 1, the Government of Canada is investing up to $1.25 million for the Eglinton Connects Streetscape and Cycle Track project. The City of Toronto is matching this funding contribution.